Kim Il Sung University’s Information Center has developed an IP phone system, according to a brief KCNA report on Thursday. IP phone systems send calls as digital data over IP (Internet protocol) based networks. 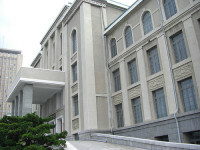 While widespread access to the Internet is not available in North Korea, the same IP technology is used on Kwangmyong, the nationwide intranet that connects universities and government offices. The new system supports calls between computers, between PCs and telephones and between telephones, said KCNA. KCNA also carried this image of people, presumably Kim Il Sung University students, using the system.